ResMed released their new line of CPAP flow generators on Monday, August 18, 2014. The AirSense 10 line of CPAP machines will replace the previous S9 model line, which is now nearly five years old. The new AirSense machines boast a handful of features with trademarked names, like myAir, AirView, SmartStart, AutoRamp, and Easy-Breathe, not to mention the trademarked names of the units themselves, including Elite and AutoSet. All the trademarked names are enough to make a person sick. I can't help you get well from TM sickness (hey, should I trademark that? ), but I can at least walk you through the AirSense features and explain the differences between the different models. In this article I'll also highlight features that are new to the AirSense line of devices. Note that I'm dropping the trademark symbol from feature names and machine names from this point forward. Applying the symbol once or twice is enough for me. Just keep in mind - especially if you're a competing CPAP device manufacturer trying to come up with cool new names for your own device's features - that most of the names ResMed uses for their products are trademarked. It appears that one of the key criteria in designing the new AirSense machines was to make data access easy for providers. All the AirSense units have wireless connectivity built-in, and all are compatible with ResMed's AirView patient monitoring software. AirView can track, analyze and report a patient's usage to a provider, all without SD cards or optional hardware modules. For the majority of patients buying CPAP equipment online, the wireless connectivity and AirView will not be important features. AirView and compliance tracking will be important for people who have jobs which require regular compliance reporting (like truck drivers, bus drivers, or anyone else who has to comply with local Department of Transportation guidelines), or for people who have insurance policies which require detailed data over a period of time to determine whether the equipment being used is medically necessary. ResMed views it's customers as the commercial providers who sell their equipment, so this wireless connectivity to AirView feature was designed with ResMed's customers in mind. But not necessarily with the end-user in mind. ResMed doesn't make its AirView software available to end-users, and that's where the myAir web application comes in. ResMed's myAir will allow for a more engaging user experience by giving the user access to the previous night's therapy data. myAir will provide personalized information based on the user's specific device and mask type, and will give the user tailored coaching, praise messages, and encouragement messages. The whole idea is to make CPAP therapy more engaging and educational in the hopes of increasing compliance and understanding. Each of the new AirSense machines has an integrated heated humidifier, called HumidAir. This is a departure from previous ResMed CPAP machines, for which the humidifier was an optional add-on component which could be removed from the CPAP flow generator. With the AirSense, you'll get a humidifier, even if you generally don't think you need one. Again, this is a good deal for commercial providers (who ResMed views as the primary customer) because it means we have fewer SKUs to order and store in inventory, because there's not a separate, stand-alone humidifier unit, nor is there a flow-generator-only unit. As a result, inventory can be drastically reduced, but end-users don't care much about that. Anyway, there are two options related to the humidifier. The first is the type of water chamber, and the second is the type of tube. The standard water chamber is openable and easily cleaned, but is not dishwasher safe. The optional diswasher safe water chamber is much easier to clean, and will undoubtedly be the preferred water tank among AirSense users. Why, you may ask, does ResMed make two different water chambers instead of just the diswasher safe one? I really don't know the answer to this. Cutting out the standard water chamber would be good for both commercial providers as well as end-users. Commercial providers like us would have less inventory, and the end-user would always receive a water tank that's super easy to clean. ResMed generally insists on being regarded as the "premium" CPAP brand, so the lower-cost water chamber included with every machine seems to contradict their past marketing efforts. If you buy an AutoSense 10 machine from us, ask us about a special offer regarding the water chamber. We'll hook you up! Each AirSense device comes with either a SlimLine (non-heated) or ClimateLineAir (heated) tube. Any standard CPAP tube can be used with AirSense devices, so you've got lots of options here. There are generally no compatibility issues with tubing, aside from the fact that ResMed's older ClimateLine tubing designed for the ResMed S9 flow generators will not work with the new AirSense flow generators. Pretty much every CPAP machine has a ramp feature, which allows the CPAP machine to start a pressure lower than the prescribed therapy pressure, and to gradually build up to the prescribed pressure over a pre-determined period of time. ResMed's AutoRamp is a more intelligent ramp feature with sleep onset detection. The AirSense machine will deliver a low pressure to help the user fall asleep. Then once the user is asleep, the CPAP machine will comfortably ramp up the pressure to the prescribed pressure. The AirSense knows when you've fallen asleep, which is pretty cool. Adjusting the ramp time is a thing of the past with an AirSense CPAP device in AutoRamp mode. Manual time-based ramping is still allowed for those who prefer it. The SmartStart feature turns the machine on as soon as you breathe into the mask. When you remove the mask, the machine stops automatically after a few seconds. Pressing a button is pretty easy, but not having to press a button to begin therapy is even easier. We talk to people all the time who really like this type of feature. We've also talked with orthodox Jews who need a feature like this because they're prohibited from "igniting a fire" on the Shabbat (Sabbath or weekly day of rest). For them, operating a switch on an electrical device is equivalent to igniting a fire, and would be considered forbidden. I don't know if ResMed or any other CPAP device manufacturer knows this, but I've always assumed they do, and I've always assumed that this type of feature was originally created specifically for those Jews who interpret the list of prohibited activities in this way. ResMed's claims of manufacturing the quietest CPAP machines have, well, quieted lately. The S9 units purportedly had a sound pressure rating of 24 dBA, making those units the quietest on the market. Other companies like Philips Respironics openly challenged ResMed's claims of having the quietest machines. Philips Respironics published a sound comparison on their website showing that their REMstar machines were quieter overall (but not necessarily by using the ISO standard for testing sound output). With the AutoSense 10 ResMed is claiming 26.6 dBA. Personally, I think it's fairly difficult for the human ear to differentiate between 24 and 26 dBA, or between 26 and 28 dBA. Tube design and mask design will almost always be bigger factors than motor design when it comes to noise in the entire CPAP circuit. With that said, the ResMed AutoSense 10 machines are sufficiently quiet and likely won't bother anyone who isn't OCD about white noise while they sleep. LIke previous ResMed CPAP machines, the AirSense devices all feature exhalation pressure relief, which reduces pressure each time you exhale. EPR makes using the device more comfortable. 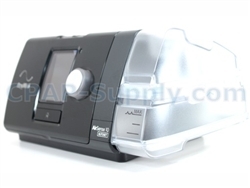 There are three primary AutoSense models - CPAP, Elite and AutoSet. There's also an AutoSet for Her model, which is just like the AutoSet, but with minor auto-adjusting algorithm adjustments specifically designed for women. The CPAP model has all the features I've mentioned, but does not include advanced event detection or auto-adjusting capability. The Elite model adds advanced event detection - specifically, the Elite has the ability to detect both Cheyne-Stokes respiration as well as central apnea. Both the CPAP and Elite models are fixed-pressure machine which blow at a fixed prescribed pressure all night long. The AutoSet model adds the auto-adjusting functionality which varies the pressure as needed throughout the night, giving the user optimal therapy at the lowest possible therapy pressure. 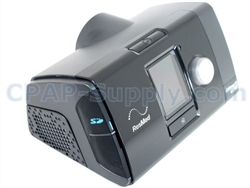 ResMed is still the only CPAP device manufacturer to offer a color LCD screen. It looks quite nice, and helps to make the ResMed appear to be a premium level CPAP device.The color palette and the quality of the screen make it extremly easy to read and navigate. A light sensor which determines the level of ambient light in the room is used to control the brightness of the LCD screen. In darker rooms, the screen brighness will be reduced automatically. In brighter rooms, the screen brightness will be increased to make the screen easier to read. The screen goes black automatically when there has been no user input for a short period of time. This saves power, of course, and it also allows you to have a completely dark room when you sleep. The color screen makes the AirSense 10 look and feel more like an Apple product than a piece of medical equipment. Each AirSense 10 device comes packed in a carrying case that's big enough to hold nearly all your CPAP gear. If you have a relatively compact mask, like an AirFit P10 nasal pillows mask, you'll be able to fit it in the front pocket of the case, or even in the main compartment. Bigger, bulkier masks may not fit. The travel case is nice. ResMed has said goodbye to the days of the cheap-looking, heavy, bulky travel case and has developed a case worthy of holding the top-of-the-line equipment that's inside it. The case is gray nylon with a couple of subtle blue accents. It has a handle and an adjustable shoulder strap for versatility. Inside the case, there are two main compartments - one for the CPAP and water chamber, and one for the power cords and tubing. All in all, the included case is a winner. There's something about the AirSense 10 devices that seems, well, 21st century. When you look at the screen and see wireless signal strength it's like looking at a tablet or a cell phone. When you can switch the device to airplane mode you realize you're dealing with a medical device that's designed to be a mobile device. When you can pull this thing out of the box and can use it without reading a single word in the user manual, you know you're using a well-designed machine. ResMed got the "feeling" right, for sure. Improvement #2: Side cover should be included with the machine so that it can be used without the water chamber installed - call us about this when you order an AirSense 10 and we'll give you a side plate for free if you want one. Improvement #3: Power supply should be smaller and built-in. Improvement #4 Every AirSense should come with a heated ClimateLineAir tube - call us about this when you order an AirSense 10 and we'll make sure you get a heated tube with your order. In general, I think ResMed should be unrelenting in designing and manufacturing small, lightweight machines. It seems that size and weight aren't important design criteria for ResMed. If the AirSense 10 could be included in the "ultra portable" category of CPAP machines, it would be a 10 out of 10. As is, it's a solid 9.